Simple and powerful title software. Property transactions and payer authentication are complex, time consuming, and resource intensive with detrimental consequences when incidents occur. 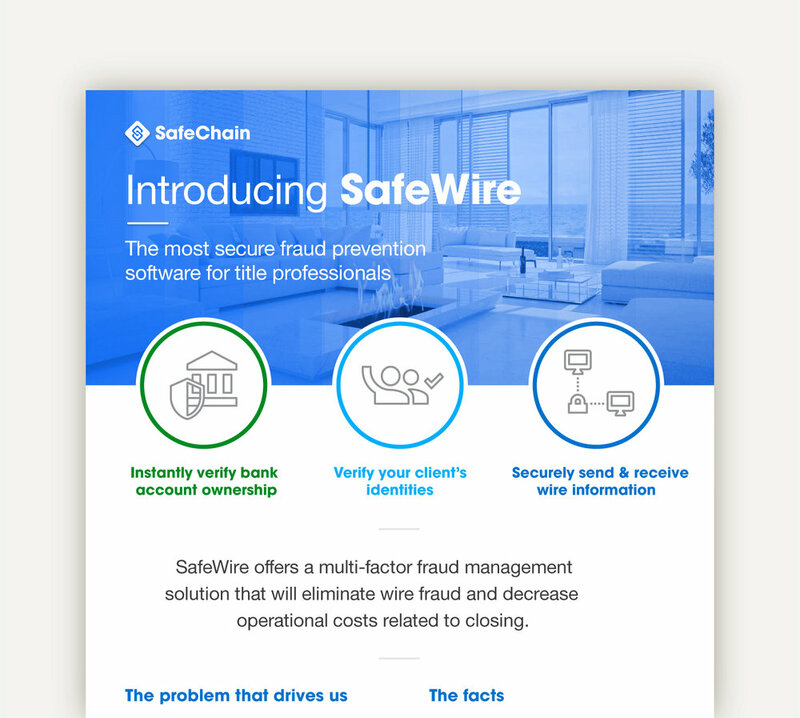 SafeWire offers a multi-layers fraud solution that will minimize fraud losses and operational costs while maximizing revenue for your title company. Special agents from the FBI Cyber Crime Unit recently visited SafeChain Headquarters to take a deep dive into responsive action plans for a fraud scenario. The following is a summary of our discussion with special agents and insight from the former “Internet Godfather,” Brett Johnson. Since 2015, there has been a 1,110% increase in BEC attempts. Today, it’s the go-to fraud scheme by cybercriminals. We developed a checklist to help title companies protect against BEC fraud scheme scenarios and implement best practices in their offices. In today's hyperconnected and digitized world, countless transactions take place every second. However, a significant portion of the digitized information is hosted on disparate systems which results in a lack of transparency, efficiency, and a higher incidence of inaccuracies resulting in greater potential for fraud. See how SafeChain's blockchain technology is poised to eliminate today's problems in property transactions and the real estate industry.